Some 16,000 Gazans riot along the fence and attempt to breach Israeli territory. 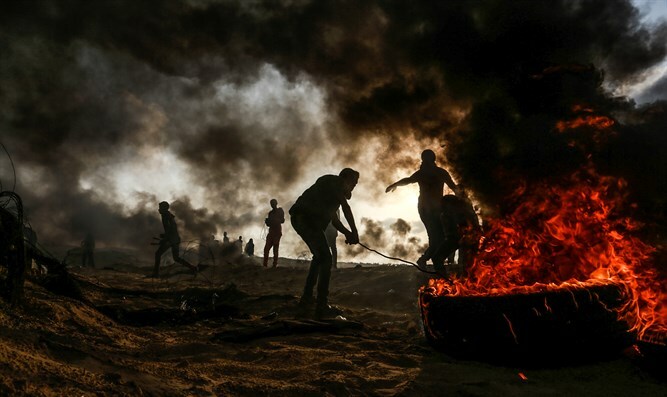 The weekly violence along the border between Gaza and Israel continued on Friday, as some 16,000 Gazans threw firebombs, grenades, rocks and burned tires along the fence. There were two incidents in which rioters briefly entered the Israeli side, the IDF Spokesperson’s Unit said. In the course of the violence, Israeli combat helicopters and aircraft attacked three terrorist positions belonging to the Hamas terrorist organization in northern Gaza. “We are acting fiercely in the face of terrorist activity, determined to protect the residents of Israel and will continue to act in their defense,” said the IDF. The Hamas-run Gaza “health ministry” said that five Palestinian Arabs were killed in Friday’s riots. The five men, aged between 22 and 27, died in separate incidents along the border fence, the ministry said, according to AFP. The violence came despite reports of progress towards an Egyptian-brokered deal to end the months of violent protests along the border. The London-based newspaper Al-Hayat reported on Friday that Israel and Hamas have reached "understandings" through the mediation of an Egyptian delegation, regarding the easing of the blockade of Gaza. The Egyptians reportedly told Hamas it must cease terror activity. In return, Israel agreed to expand Gaza's fishing zone, continue to supply Gaza with fuel and augment its supply of electricity. The violence on Friday came despite the fact that Defense Minister Avigdor Liberman earlier this week ordered the resumption of the supply of fuel from Israel to Gaza, which was halted following the recent escalation in events in the Gaza envelope region.